CALL FOR ART : You Can Do It! POSTER SHOW CALL FOR ART! EDIT (4.18.13) Thanks, Everyone, for submitting your names! We'll have a final list of artists announced shortly! But not just any posters! We're looking for artists and designers interested in creating gorgeous type-centric words of wisdom, encouragement and pieces with an all-around 'you can do it' flavor! Humorous, serious, inspirational or even words meant as ‘tough love’ are all fair game. I used to look up at that poster on my wall and say "You're right, kitten! If you can hang in there, so can I!" Think of all of the people you can inspire to make work, do things, keep going, and feel good about doing so! The whole month of June at Light Grey will be focused around the idea of doing more, getting things done and staying motivated. We’ve got some great lectures and topics planned for you guys. Each poster will be hung (of course!) in our gallery in Minneapolis as well as featured online on our site, and on the shop! 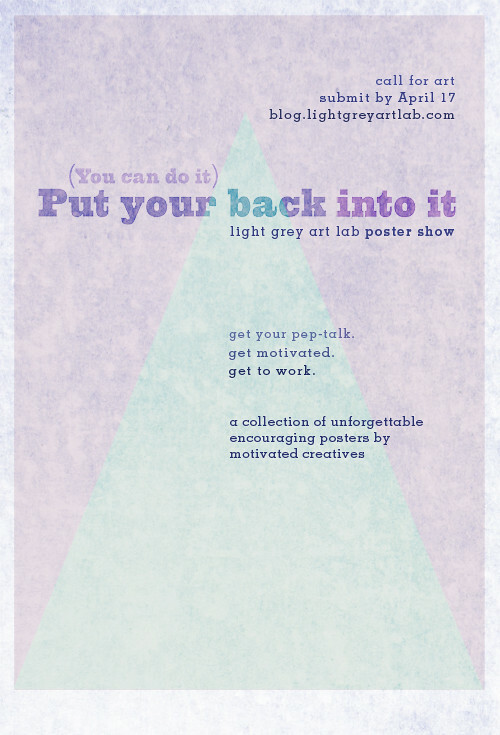 So, if you’re interested in making a poster for our upcoming motivational poster-show, please put your name, email and website below by April 17th!